I’ll be the first to admit that I’m not exactly a geography ace. At school I never particularly liked the subject, but nowadays I wouldn’t mind having better knowledge of the earth. Maybe I can practice using GeoEdu? Read on to find out it that’s possible, and if it’s a fun app for those among you who are well travelled or simply have a lot of geographical knowledge. I think the fun you’ll have with this game and the challenge you’ll feel it represents may be contingent on how fit you are in geography, but I can imagine that situating cities would be entertaining even to those who are already, shall we say, more advanced than I am. 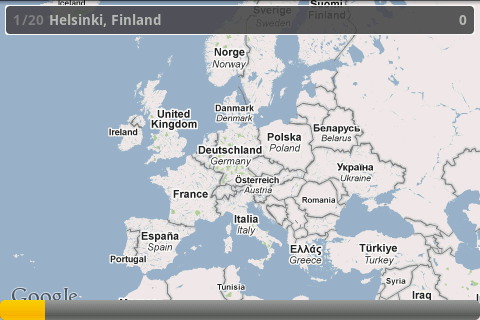 Once you’ve started GeoEdu you can pick a map/continent. 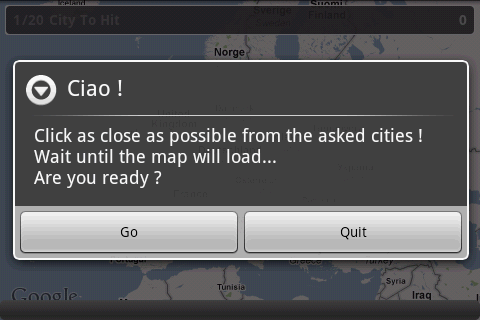 (All continents are displayed as maps.) Once you’ve selected a continent the screen display switches to horizontal. You will be given a list of cities and landmarks which you will have to locate on the map. The name of the city/landmark appears in the upper half of the screen, the amount of time that has elapsed in the bottom. 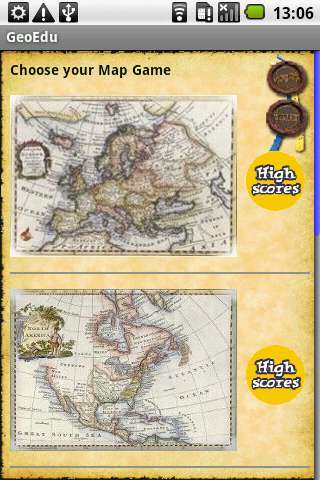 Two flags show you where you clicked on the map and where the location in question is actually situated. 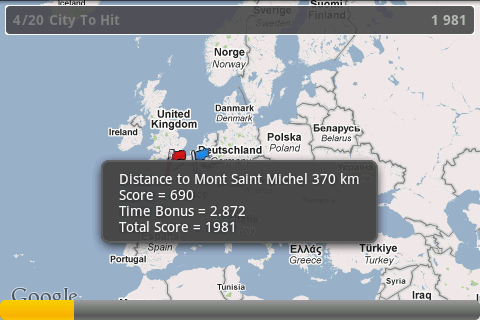 A pop up window gives you more information in regards to how big the distance is, as well as Score, Time, Bonus, and Total Score (you can switch this off under Settings). The degree of difficulty depends largely on which map you choose to use. For instance, if you pick the European continent and the question is locate Paris or Nice, all you have to do is click on France, as the country is so small that it’s impossible to click on individual cities. If you’ve chosen the South America map you will have to be a bit more precise when asked to located places in Brazil or Peru. 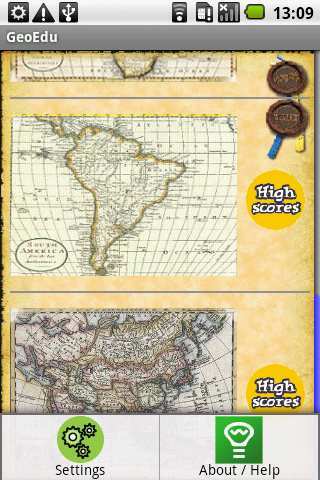 GeoEdu is a fun little game that can help you build up your general knowledge of geography. As I said, even if you aren’t as much as a dud as I am, you might still enjoy playing this game in order to test your knowledge. I’m sorry to say the GeoEdu doesn’t exactly perform well when it comes to speed. The app struggles even on the Milestone. I can’t say whether this is due to data being downloaded… all I know is that it wasn’t satisfactory. 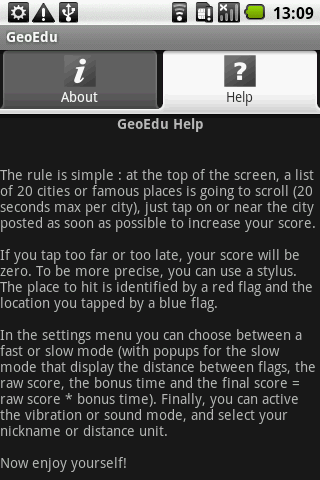 GeoEdu can be downloaded free of charge from the Android Market. Yeah, just goes to show that I'm as big of a geo dunce now as I was then.